A player can target up to two players and toggles if they are in the chain. A second option is to discard the chains and draw another card. Whenever any player in the chain takes elemental damage, all other members in the chain receive the same. After a player takes damage in the chain, they are restored out of the chain. 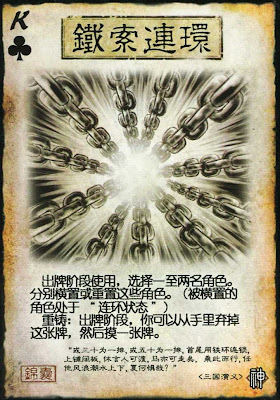 To signify that a player is in the chain, they general card is put in landscape orientation rather than portrait. In or out of the chain is a toggle status. There is no special tie between people that were put in the chain together. All people in the chain are locked together. The only way to get out of the chain without taking damage is to use a Chains. When damage travels through the chain, it is based off the person who initially received the damage. All other people in the chain receive damage that is the same element and amount. When each player recieves that damage, it can be modified at that point individually. This usually takes place with the Wood Armor or Silver Helmet. For example, all players are in Chain, and Cao Cao is hit with two fire damage. All other players are then hit with two fire damage as well. When it reaches Liu Bei, who has the Wood Armor, it is increased to 3 fire damage. This increase only affects Liu Bei. Sun Quan, who had the Silver Helmet, only takes one damage. Lu Bu, next in the order, still takes 2 fire damage because that is the original amount that started. When players use a Negate it is for one player only. The other player must still enter the chain. If a player decides to trade in their Chains, this cannot be negated. This is because it is not treated as using the Chains.